SINO PK blow mould adopts the most advanced CAD design software to make the blow mould design. Meanwhile we use CAM tooling way to tool the bottle blow mould, guarantee the good precision. Regarding the bottle blow mould steel, we adopt stainless magnesium aluminum alloy steel. This steel could make the bottle surface smoother, good shape formed. 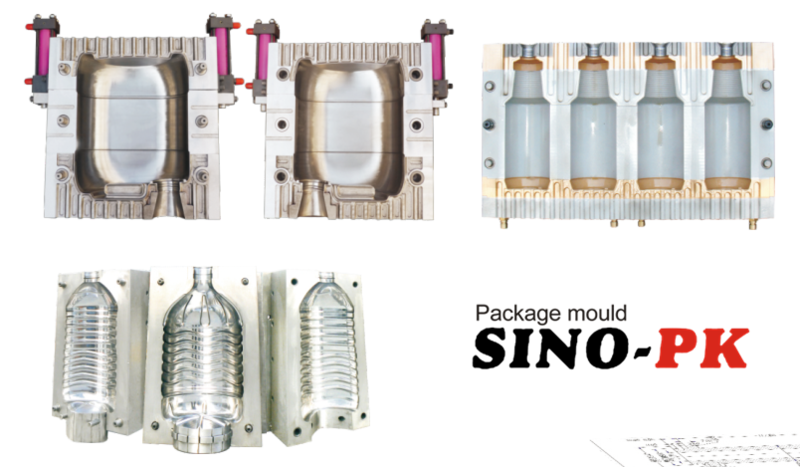 And for the bottle blow mould cooling channel design, we have our specialized cooling design which could reduce the bottle formed cycle time and guarantee the mould quality at the same time. The advantage for adopting magnesium aluminum alloy steel is the aluminum steel has good thermal conductivity. Besides, the mould weight is very light which could increase the mould opening closing speed. In addition, the cooling speed is very fast could improve the bottle quality.